A DOI is a unique numbering system managed by the International DOI Foundation. If you're really curious you can go to the foundation website and learn all the details. Basically, the idea is that by assigning digital objects a unique number that never changes it will be easier to find these objects on the Internet. It is similar to an ISBN number for a book that is published and an ISSN number for a periodical. 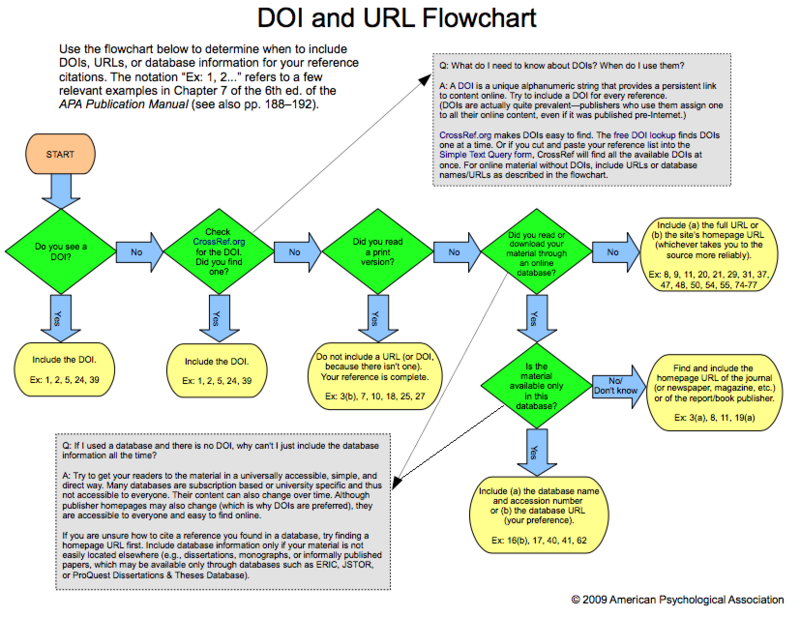 When the American Psychological Association published its 6th edition style manual in 2009 it began requiring the use of DOI's at the end of the citation for any article published in digital format. 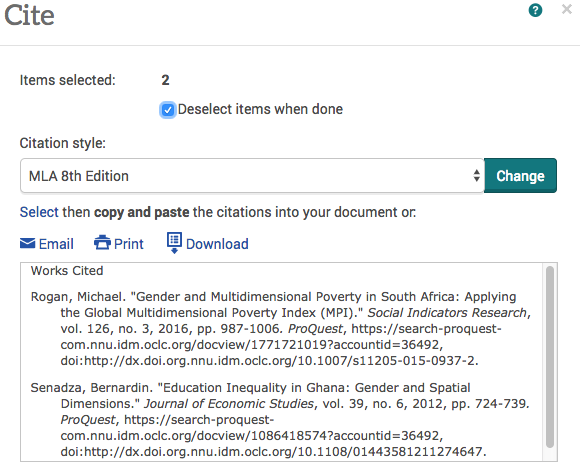 If you are using a library database and click on the "cite" tool and view the APA style format you will see that it appears at the end of the citation..sometimes. Sometimes it won't be there. Always check with your professor and see if he or she has a preference. What if I Use an Article or Book Chapter and the Database does not include the DOI? Follow the OWL at Purdue guide for citing articles from periodicals. NOTE: Always verify the formatting of electronically generated reference citations with either OWL @ Purdue, the citation style manuals, a librarian, or a writing center tutor. After clicking on the article title, click the Cite option listed in the navigation column to the right. Scroll to find the the citation style you need for your assignment. Copy and paste the source citation into your working document. At the results page, check the box next to the articles for which you wish to generate citations. Just above the results and to the right are four options: Cite, Email, Print, and Save. 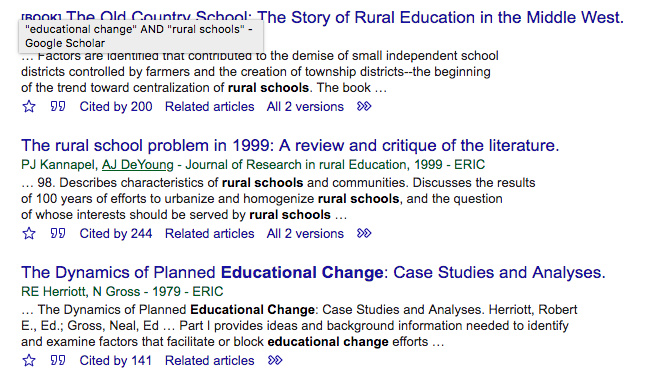 After you have checked the box(es) for the article(s), choose the Cite option. A drop down menu provides a menu of the various citation styles. Select the appropriate style. The citations will appear in the box below the drop down menu. Copy and paste the citations into your working document. Scroll to the bottom of the selected article. You will see options for APA, Chicago, Harvard, and MLA. Select the option for APA. Copy and paste the source citation into your working document. NOTE: You do not need to copy the URL. Instead, you can say, "Retrieved from Credo Reference." At the results page, below each article reference and to the right of the star icon is a single quote mark (") icon. Select this icon and a list of citation styles will appear. Copy and paste the citation for your source from the appropriate style. On the results page each article will have box on the right sight labeled "Cite This Item." Click the box, and three options for citation: MLA, APA, and Chicago. Copy and paste the appropriate citation to your working document. Just below the three citation styles is a heading for "Export Citation." If you are exporting the citation to a system, such as Zotero, click the "Export a RIS file," link and the citation will be exported to Zotero. After clicking on the article title, click the Cite Now option listed at the top right. Click on the style of choice. Copy and paste the source citation into your working document. After clicking on a country article, scroll down to the end of the contents. 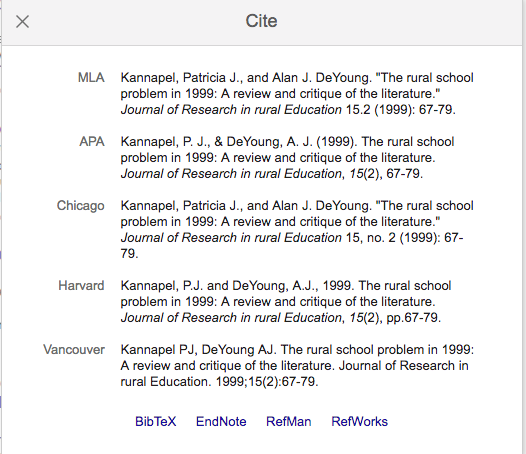 Click the Cite this Document tab, and select the citation style. Copy and paste the source citation into your working document. 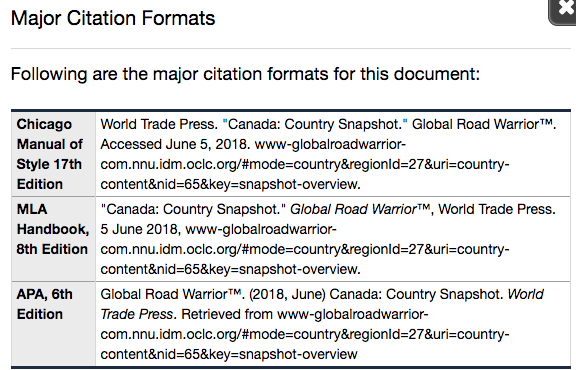 For the APA style, you would replace the url with only the database name, in this case, Global Road Warrior. World Trade Press. (2018, June). Canada: Country snapshot. World Trade Press. Retrieved from Global Road Warrior. After clicking on the article title from the list of results, select the Cite option listed at the top in the navigation bar. Select the citation style. The source citation will be listed at the top of the article. 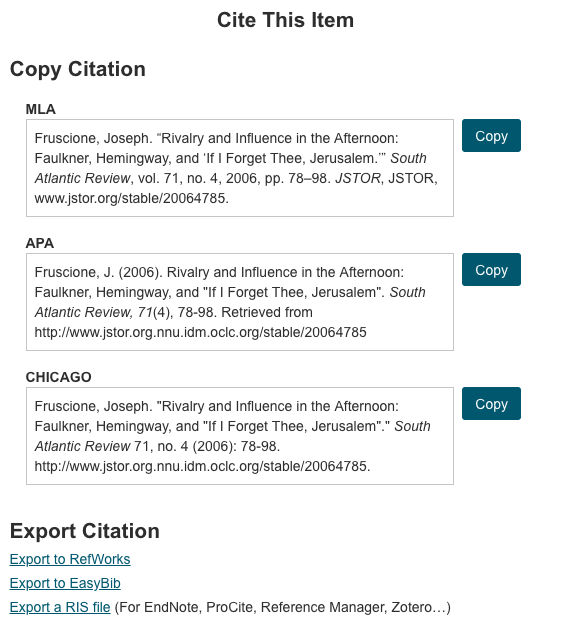 Copy and paste the source citation into your working document.